I use onions almost every day. 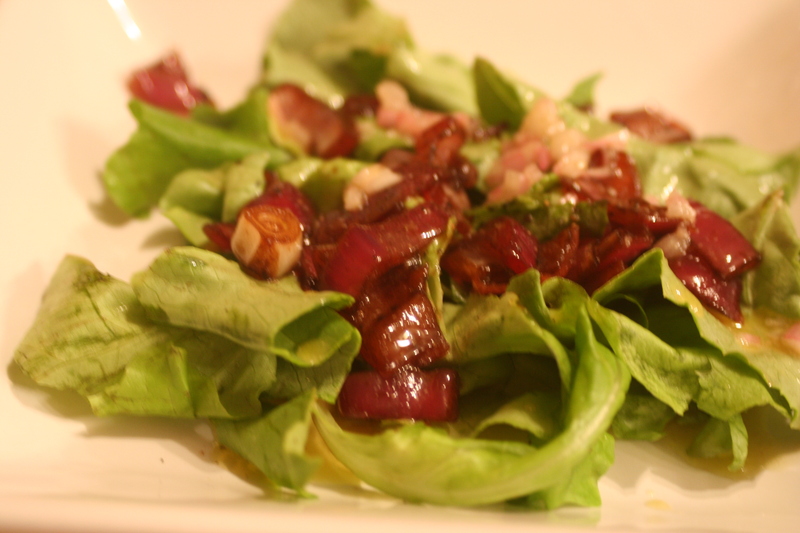 They start my soups and sauces, they top my pizzas or potatoes, and they find their way into salads, too. They offer fantastic flavor and can change a dish just by their addition. They grow underground and there are a variety of types. 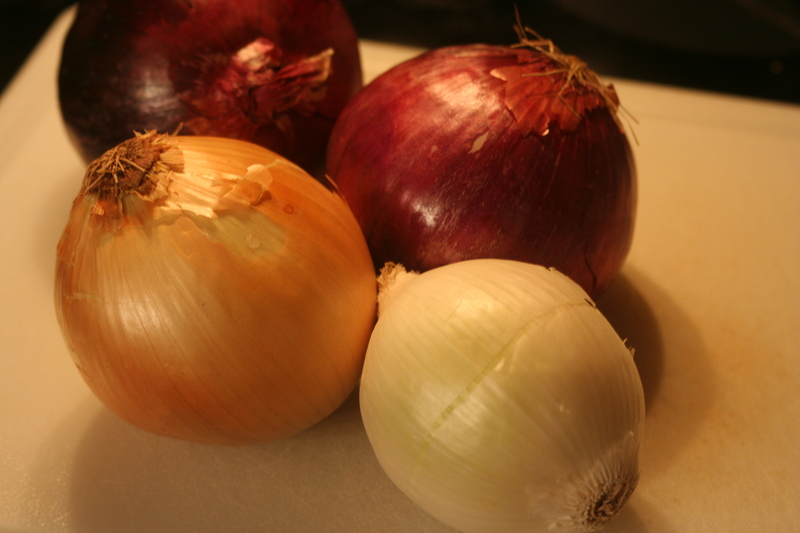 Red, yellow, and white are quite common as well as green onions, sweet onions, vidalia and others. Melt butter in a saute pan over medium-low to medium heat. Add onions. 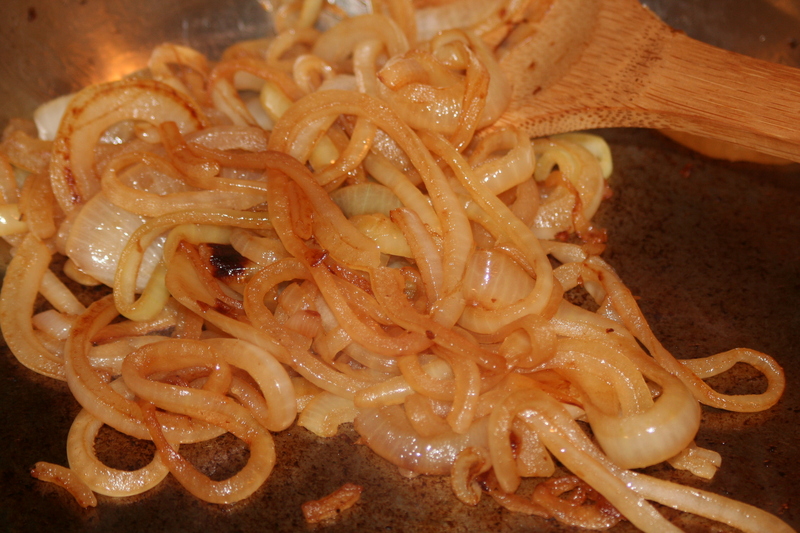 Let cook stirring occasionally for 20-30 minutes or until onions are brown and caramelized. Delicious on pizza, bread, baked potatoes, salads, steaks, burgers, and more. 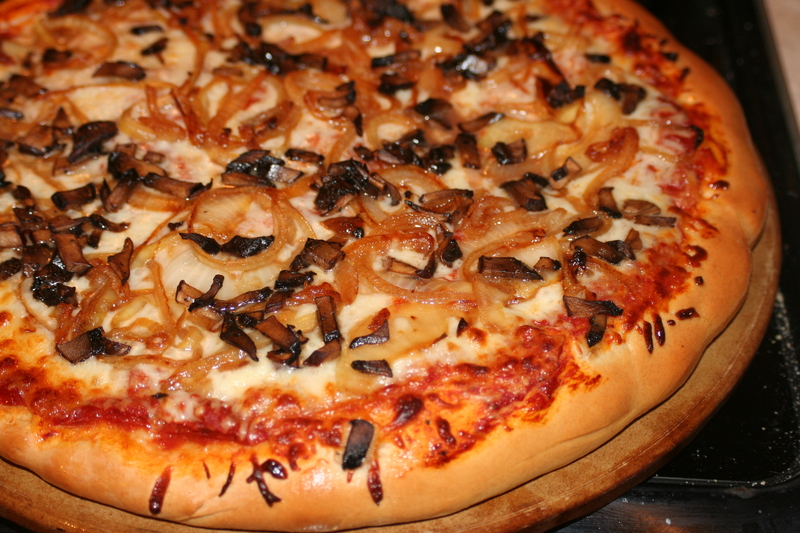 The above is a carmalized onion and portabella mushroom pizza - yum! In a lg. saucepan, melt butter. Stir in onions. Cook, covered, over medium-low heat for 8-10 minutes or till tender and golden, stirring occasionally. Stir in beef broth, dry sherry or wine, worcestshire sauce, and pepper. Bring to boiling, reduce heat. Cover and simmer for 10 minutes. 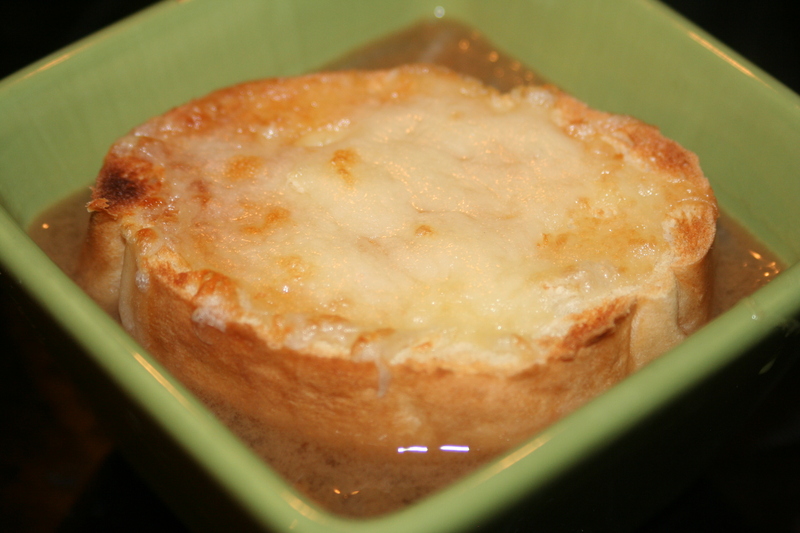 Meanshile, sprinkle toasted bread with shredded cheese, Place bread under broiler till cheese melts and turns light brown. To serve, ladle soup into bowls and float bread atop. Makes about 4 1/2 c.
I thought this could use a little thyme or parsley to brighten it. My friend, Amy, sent me this recipe that she says her family loves! This was a delicious salad! You could add feta, nuts, chicken, or other toppings would be wonderful! Cut the onions in 1/2 and slice 1/4-in. thick, place on a baking sheet and toss with: 1/4 c. balsamic vinegar, 1/4 c. olive oil, 1 tsp. salt and 1/2 tsp. pepper. 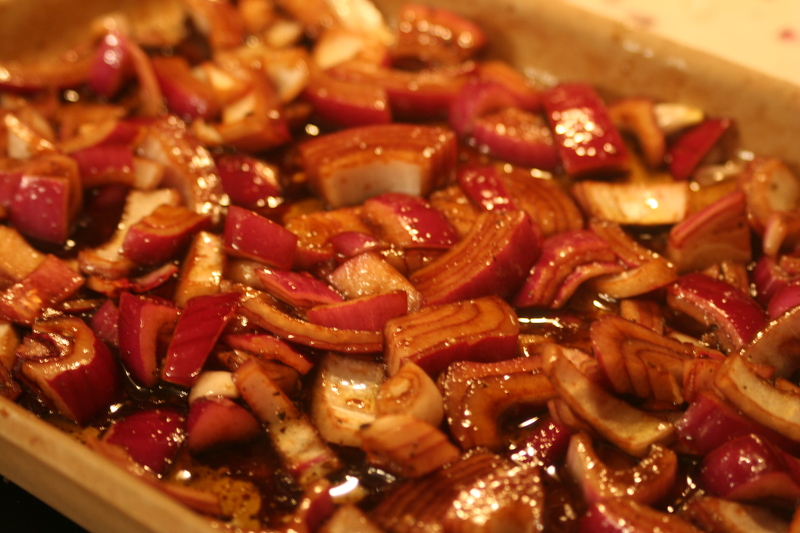 Whisk together the shallots, mustard, red wine vinegar, 1/2 tsp. salt and 1/2 tsp. pepper in a small bowl. While whisking, add 3/4 c. olive oil until emulsified. I love onions as well, but do you have any recommendations for chopping them? I suppose knife technique is another post, but they always make me cry. Cutting frozen onions or under water (as I've heard) doesn't seem safe. 1. Cut the onion under running water. 2. Hold a piece of bread in your mouth while cutting. There's also a really cute-looking product called the Onion Goggle (or maybe Goggles) I'm too cheap to try; I've been told by a friend that it works! Hey Sarah - I don't have any great suggestions except using a very sharp knife. Wearing contacts usually saves me from the tears. I have never tried cutting it under water. Tinky - I will definitely have to give the red wine a try! First of all, I love onions! They go in just about everything around. Jeremy even likes them raw...I'm not such a fan.